When we release a quotation for a polished concrete floor where the concrete has yet to be laid, we stipulate that a particular concrete specification is met. The quality of the concrete installation is vital to a successful outcome, so this specification forms part of our terms and conditions, all of which are explained and issued at the quotation stage. The purpose of the concrete specification we provide before a concrete floor is installed is to guarantee the best possible outcome when we polish the floor. Many people believe concrete is concrete, but when it comes to polishing concrete, it’s an entirely different story. The quality of the concrete has a huge impact on the overall finish. 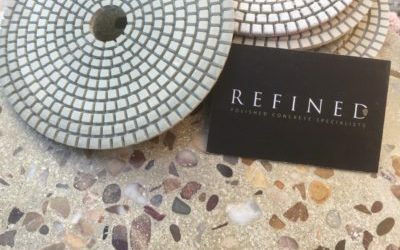 Aesthetics are everything with polished concrete, so it’s vital not to cut corners when having it laid because you can guarantee it will show up in the final product. It’s for this reason that we are incredibly strict about the concrete specification and choosing wisely on who is laying the concrete. Our answer is that we specialise in the art of diamond processing concrete. To be the best in the industry at what we do, we concentrate entirely on this skill. Whilst some people may think we just push various machines around, this could not be further from the truth. ‘Concrete isn’t hard to lay’. This is a massive misconception, not only amongst lay people but within the building industry too. Whilst it’s true that anyone can lay concrete, laying concrete correctly to a good standard, is a different matter and very skilled work. We are great believers that specialists should specialise. When it comes to polished concrete, the quality of the mix and lay is absolutely vital if you’re after a high-quality outcome. The cost of polished concrete depends on a number of factors – speak to us today to discuss your needs. When concrete is laid for a floor that is to be polished it must be finished and cured in a certain manner. The reason we provide detailed specifications and various educational materials is to help you achieve a stunning high-quality floor. We have various options available on the pricing page of our website to guide you. Whether we’re dealing with old or new concrete, we will be able to assist you with your options. 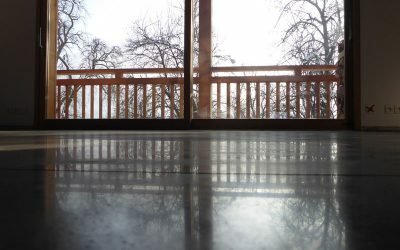 How much does it cost to have a polished concrete floor? We can offer ballpark figures on a per-square-metre basis on the assumption that you have a floor that meets our concrete specification, which usually comes in at around £50 per square metre. The full answer to this is that every project is unique and different approaches have to be taken, so the best way to find out is to request a formal quotation. All our quotations stipulate that a minimum concrete specification is met. It is always a good idea to have a figure in mind that you are willing to pay when considering how much does polished concrete cost. All this effort for a floor… Why? The list of benefits when the right process has been taken is huge compared to other flooring options and not to mention the sheer beauty of the floors is something that cannot be replicated. We take huge pride in creating something truly special and when you see these floors, you really can understand what all the fuss is about and that it really is worth that extra planning.